Selling plants could save them from extinction. The key is growing them in their natural habitats, not on private properties or nurseries, according to FIU conservation ecologist Hong Liu. The goal is to sell some and leave the rest to replenish populations in nature. The restoration-friendly, small-scale cultivation scheme could provide the plants needed for food, medicine, decorations and other uses to customers while generating income for farmers and giving threatened plants a chance at survival, she said. 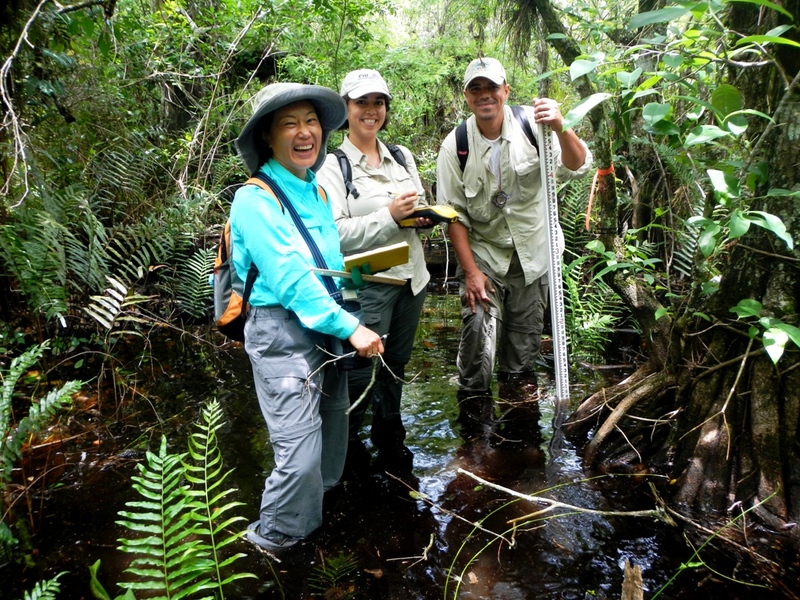 Hong Liu (left) and her students Haydee Borerro (center) and Jason Downing (right) conduct research in the Fakahatchee Strand Preserve State Park in 2014. The research team led by Liu examined 200 species of plants throughout Canada, China, India, Mexico, the United States and a number of developing nations. Environmental degradation and over-exploitation are the two biggest drivers of plant extinction throughout the world. Plants make up the majority of species on the International Union for Conservation of Nature (IUCN) Red List of Threatened Species, the world’s most comprehensive conservation status inventory. Most commercial cultivation studies focus on animals, so Liu says more research must be done on the same concepts for plant conservation. The study was recently published in Conservation Biology. Liu is a researcher in FIU’s International Center for Tropical Botany and professor in the Department of Earth and Environment. The International Center for Tropical Botany is dedicated to the conservation and sustainable use of tropical plants through research, education and outreach. It is a partnership between FIU and the National Tropical Botanical Garden.